Cooling classes of liquid-immersed transformers are covered by IEEE C57.12.00 A short explanation of each class follows. There are three classes in this category. 1. Class OA: Oil-immersed, self-cooled. Transformer windings and core are immersed in some type of oil and are self-cooled by natural circulation of air around the outside enclosure. Fins or radiators may be attached to the enclosure to aid in cooling. 2. 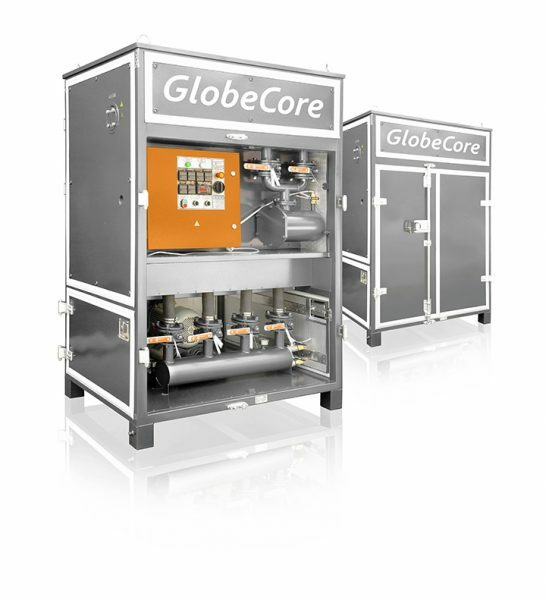 Class OA/FA: Liquid-Immersed Transformers, self-cooled/forced air-cooled. Same as OA, with the addition of fans. Fans are usually mounted on radiators. The transformer typically has two load ratings: one with the fans off (OA) and a larger rating with fans operating (FA). Fans may be wired to start automatically at a pre-set temperature. 3. Class OA/FA/FA: Liquid-immersed, self-cooled/forced air-cooled/forced air-cooled. Same as OA/FA, with an additional set of fans. There typically will be three load ratings corresponding to each increment of cooling. Increased ratings are obtained by increasing cooling air over portions of the cooling surfaces. Typically, there are radiators attached to the tank to aid in cooling. The two groups of fans may be wired to start automatically at pre-set levels as temperature increases. There are no oil pumps. Oil flows through the transformer windings by the natural principle of convection (heat rising). Liquid-Immersed Transformers, Air-Cooled/Forced Liquid-Cooled There are two classes in this group. 1. Class OA/FA/FOA: Liquid-immersed, self-cooled/forced aircooled/forced liquid, and forced air-cooled. Windings and core are immersed in some type of oil. This transformer typically has radiators attached to the enclosure. 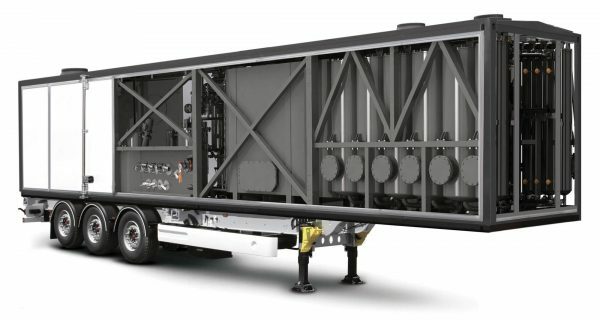 The transformer has self-cooling (OA) natural ventilation, forced air-cooling FA (fans), and forced oil-cooling (pumps) with additional forced air-cooling (FOA) (more fans). The transformer has three load ratings corresponding to each cooling step. Fans and pumps may be wired to start automatically at pre-set levels as temperature increases (figure 26). 2. Class OA/FOA/FOA: Liquid-immersed, self-cooled/forced oil, and forced air-cooled/forced oil, and forced air-cooled. 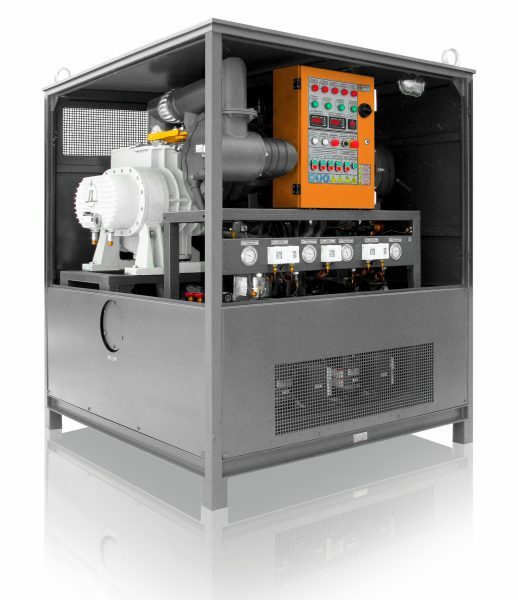 Cooling controls are arranged to start only part of the oil pumps and part of the fans for the first load rating/temperature increase, and the remaining pumps and fans for the second load rating increase. The nameplate will show at least three load ratings. 1. 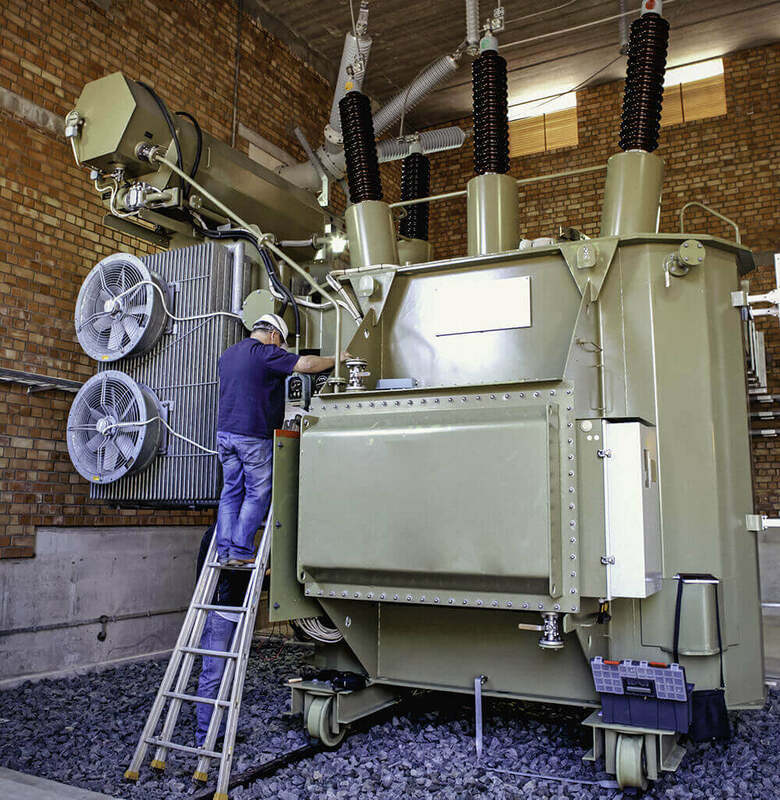 Class OW: Transformer coil and core are immersed in oil. 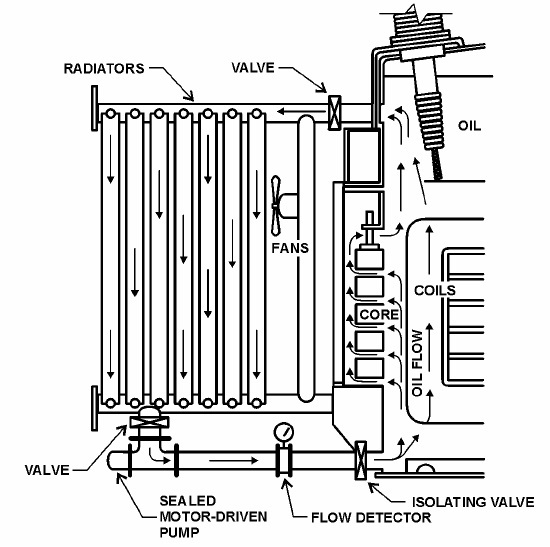 Typically, an oil/water heat exchanger (radiator) is attached to the outside of the tank. Cooling water is pumped through the heat exchanger, but the oil flows only by natural circulation. As oil is heated by the windings, it rises to the top and exits through piping to the radiator. As oil is cooled, it descends through the radiator and re-enters the transformer tank at the bottom. 2. Class OW/A: Transformer coil and core are immersed in oil. This transformer has two ratings. Cooling for one rating (OW) is obtained as in item 1. above. The self-cooled rating (A) is obtained by natural circulation of air over the tank and cooling surfaces. 1. Class FOA: Liquid-immersed, forced liquid-cooled with forced air-cooled. This transformer normally has only one rating. The transformer is cooled by pumping oil (forced oil) through a radiator normally attached to the outside of the tank. Also, air is forced by fans over the cooling surface. 2. Class FOW: Liquid-immersed, forced liquid-cooled, water cooled. This transformer is cooled by an oil/water heat exchanger normally mounted separately from the tank. Both the transformer oil and the cooling water are pumped (forced) through the heat exchanger to accomplish cooling. 3.4.5.1 Leaks – Tanks and radiators may develop oil leaks, especially at connections. To repair a leak in a radiator core, you must remove the radiator. Small leaks may also develop in headers or individual pipes. These small leaks possibly may be stopped by peening with a ball peen hammer. Some manufacturer’s field personnel try to stop leaks by using a two-part epoxy while the transformer is under vacuum. Do not try this unless the transformer has been drained, because a vacuum may cause bubbles to form in the oil that can lodge in the winding and cause arcing. Some contractors will stop leaks by forcing epoxy into the leak area under pressure. This procedure has been successful in many cases and may be performed while the transformer is online. When all else fails, the leak may be welded with oil still in the radiator if proper precautions are carefully observed [3, 4]. Welding with oil inside will cause gases to form in the oil. Take an oil sample for a dissolved gas analysis (DGA) before welding and 24 hours after re-energizing to identify gas increases due to welding. If the leak is bad enough, the tank may have to be drained so the leak can be repaired. Treat leaks carefully; do not ignore them. Oil leaks are serious maintenance and environmental issues and should be corrected. See Power Equipment Bulletin 23 for further information on leak remediation. Cleaning Radiators – Radiators may need to be cleaned in areas where deposits appear on pipes and headers. Dirt and deposits hamper heat transfer to the cooling air. Finned radiators must be cleaned with compressed air when they become dirty. Plugged Radiators – After 1 month of service and yearly, perform an IR scan and physical inspection of radiators and transformer tanks [4, 8]. Partially plugged radiators will be cooler than those performing normally. You may also feel the radiator pipes by hand. Plugged radiator sections or individual pipes/plenums will be noticeably cooler; however, you will not be able to reach all of them. Radiators may become plugged with sludge or foreign debris; this usually occurs in water tubes on the oil/water heat exchanger. Do not forget to check the bleed line for two-walled heat exchangers. If plugged radiators are discovered, they must be corrected as soon as possible. Some radiators are attached to the main tank with flanges and have isolating valves. These may be removed for cleaning and/or leak repair without draining oil from the transformer. If radiators are attached directly to the main tank without isolating valves, oil must be drained before cleaning them. If radiators are plugged with sludge, the transformer probably is sludged up also. In this case, the oil should be reprocessed and the transformer cleaned internally. Competent contractors should be obtained if this is necessary. Sludge Formation – If temperature seems to be slowly increasing while the transformer is operating under the same load, check the DGA for moisture, oxygen, acid number, and the interfacial tension (IFT). The combination of oxygen and moisture causes sludging, which may be revealed by a low IFT number and/or acid number. Sludge will slowly build up on windings and core, and the temperature will increase over time. Valve Problems – If your transformer has isolating valves for radiators, check to make sure they are fully open on both top and bottom of the radiators. A broken valve stem may cause the valve to be fully or partially closed, but it will appear that the valve is open. Mineral Deposits – Don’t even think about spraying water on the radiators or tank to increase cooling, except in the most dire emergency. Minerals in the water will deposit on radiators as water evaporates and are almost impossible to remove. These minerals will reduce the efficiency of cooling still further. Using additional fans to blow air on radiators and/or the transformer tank is a better alternative . Low Oil Level – One IR scan performed on a transformer running at higher than normal temperature revealed that the oil level was below the upper radiator inlet pipe, which prevented oil circulation. The oil level indicator was defective and stuck on normal. These indicators must be tested, as mentioned below. Cooling System Inspections After 1 month of service and yearly, inspect and test the fans. Look at the fans whenever you are around transformers in the switchyard or in the powerplant. If it is a hot day and transformers are loaded, all the fans should be running. If one fan is stopped and the rest of the group is running, the inactive fan should be repaired. During an inspection, the temperature controller should be adjusted to start all the fans. Listen for unusual noises from fan bearings and loose blades and repair or replace faulty fans. Bad bearings can also be detected with an IR scan if the fans are running. After 1 month of service and yearly, inspect and test the oil pumps. Inspect piping and connections for leaks. Override the temperature controller so that the pump starts. 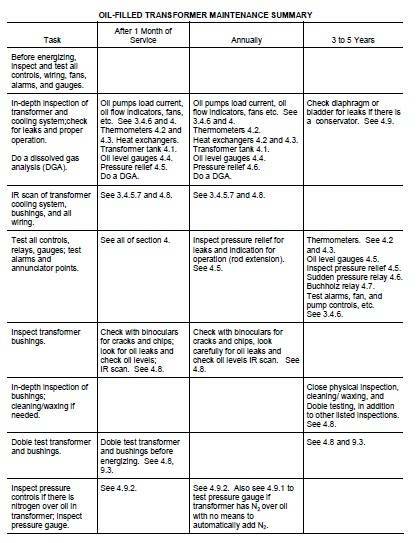 Check the oil pump motor current on all three phases with an accurate ammeter; this will give an indication if oil flow is correct and if unusual wear is causing additional motor loading. Record this information for later comparison, especially if there is no oil flow indicator. If the motor load current is low, something is causing low oil flow. Carefully inspect all valves to make sure they are fully open. A valve stem may break and leave the valve partially or fully closed, even though the valve handle indicates the valve is fully open. Pump impellers have been found loose on the shaft, reducing oil flow. Sludge buildup or debris in lines can also cause low oil flow. If motor load current is high, this may indicate impeded pump rotation. Listen for unusual noises. Thrust bearing wear results in the impeller advancing on the housing. An impeller touching the housing makes a rubbing sound, which is different from the sound of a failing motor bearing. If this is heard, remove the pump motor from the housing and check impeller clearance. Replace the thrust bearing if needed, and replace the motor bearings if the shaft has too much play or if noise is unusual. Three-phase pumps will run and pump some oil even if they are running backwards. Vane type oil-flow meters will indicate flow on this low amount. The best indication of pump running backwards is that sometimes the pump will be very noisy. The motor load current may also be lower than for full load. If this is suspected, due to the extra noise and higher transformer temperature, the pump should be checked for proper rotation. Reverse two phase leads if this is encountered. After 1 month of service and yearly, check the oil flow indicator. It has a small paddle which extends into the oil stream and may be either on the suction or discharge side of the pump. A very low flow of only about 5-feet-per-second velocity causes the flag to rotate, which indicates normal flow. Flow can be too low, and the indicator will still show flow. If there is no flow, a spring returns the flag to the off position, and a switch provides an alarm. With control power on the switch, open the pump circuit at the motor starter and make sure the correct alarm point activates when the pump stops. Check that the pointer is in the right position when the pump is off and when it is running. Pointers can stick and fail to provide an alarm when needed. Oil flow may also be checked with an ultrasonic flowmeter. Ultrasonic listening devices can detect worn bearings, rubbing impellers, and other unusual noises from oil pumps. Pumps can pull air in through gaskets on the suction side of the pumps. The suction (vacuum) on the intake side of the pump can pull air through gaskets that are not tight. Pump suction has also been known to pull air through packing around valve stems in the suction side piping. This can result in dangerous bubbles in the transformer oil and may cause the gas detector or Buchholz relay to operate. Dissolved gas analysis will show a big increase in oxygen and nitrogen content . High oxygen and nitrogen content can also be caused by gasket leaks elsewhere. After 1 month of service and yearly, inspect water-oil heat exchangers. Test and inspect the pumps, as mentioned above. Look for and repair leaks in piping and heat exchanger body. Examine the latest dissolved gas analysis results for dissolved moisture and free water. If free water is present and there are no gasket leaks, the water portion of the water-oil heat exchanger must be pressure tested. A leak may have developed, allowing water to migrate into the transformer oil, which can destroy the transformer. If the heat exchanger piping is double walled, check the drain for water or oil; check manufacturer’s instruction manual.